Every year in early March, I fire up my computer and imagine my way to Alaska for what I see as the rite of spring. 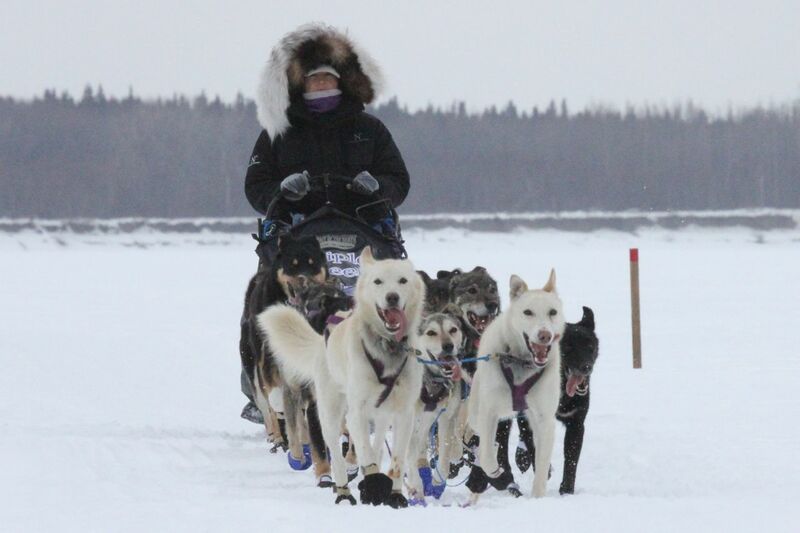 There, through the mountains, along the tundra and over the Yukon River’s thick ice, the dogs are running. These dogs are not the “Boses” that Henry Thoreau cites from time to time as further symbols of the habit-ridden town; these dogs are sled-dogs, dogs born to run, and this is their annual chance at the Iditarod, the world’s premier mushing event. Beginning just outside of Anchorage and aiming for thousand-mile distant Nome, the “last great race” supposedly replicates an early 20th-century emergency run to deliver diptheria serum to a town that might die without it. The mushers and dogs became heroes, and each year some 60 sled-dog teams and their drivers tap into that heroic spirit for their nine or ten or more days on the trail to Nome. Really, the race pays homage to the spirit of the various solitaries drawn to Alaska’s vastness and promise. In winter, the only way of travelling distances through this interior was by dog-sled. Even as the dogs (who run best at around zero degrees) and their human companions press into Alaska’s marrow-chilling heartland, around here, crocuses often open their cupped hands to the sun. This year, however, there’s an odd inversion at work. Today, we’re back in the land of horizontal snow while most of us pine for spring. Schools are cancelled, tennis nets recently raised in hope droop, the northeast wind drifts snow around five kayaks dragged near the Sudbury. Yesterday’s snow-in-the-air that wouldn’t stick has given way to the return of winter’s coat. And, some five hours behind us in their day, this year’s dog-teams have hit the midpoint turn to the north along the Yukon, where…the temperatures have been in the 40s all night long. Yesterday, along sections of the trail, they flirted with 50 degrees. Even in my furless state, I can imagine that this isn’t great weather for the dogs with their winter-thick ruffs. The next time it’s 50-degrees here – will it ever be 50 again? – I can deepen my sympathy by layering on my parka and going for a run. Still, the dogs look happy. The Iditarod’s website is rife with photos and videos of these running dogs as they arrive in teams of 12 or 16 at the various checkpoints – often hamlets of 40 or 70 people in Alaska’s roadless interior – and the dogs are the embodiment of life. If our lives are often quests to find what we “are meant to do,” here are some models, I think. Long silly for dogs, I watch them lope along through winter’s fading landscape and see joy and possibility; they are the advent of spring. I notice you don’t say anything about our local Iditarod connection- the Wayland vet who, the Alaskans say, “taught us how to take care of our dogs”. And who trained his Iditarod team along the banks of the Sudbury, on a stretch Thoreau once paddled. And by the way, he trained in the summer. The same way the Alaskans do, on sleds with wheels.